Ant-Man and the Wasp, like the generally fun trifle of a introductory film that it serves as a sequel to, is an amusing and diverting but ultimately shallow and inconsequential doodle on the margins of the gargantuan Marvel Cinematic Universe. This position is made even more starkly evident by its release a mere two months after the seismic superhero-caust of Avengers: Infinity War, whose (temporarily?) MCU-altering climactic events do not touch this predictably slick action-comedy (at least until its mid- and post-credit scenes, which I will not detail in any way). Though not outside of the larger narrative stream, Ant-Man and the Wasp is absorbed with its own concerns. Like most MCU films, it balances action, humour, character arcs, emotion, and mythology with a keen equilibrium that never feels like it’s following the formula it relies upon. Unlike the best MCU films (the Captain America trilogy, Thor: Ragnarok, the remarkable Black Panther) but very like its predecessor Ant-Man, it foreswears any sort of political themes or applicability. This movie is a lark, the very embodiment of a summer popcorn movie. And yet the (highly-constructed) rupture in the Marvel movie world that awaits it (the film’s events occur just before the events of Infinity War) casts a pall over the frothy brightness of Ant-Man and the Wasp nonetheless. In its very establishing premise, of course, Ant-Man and the Wasp is integrated into the larger events of the rhizomatic MCU. Erstwhile Ant-Man Scott Lang (Paul Rudd) is on the verge of completing two years of FBI-mandated house arrest for his cameo appearance in the intra-Avengers battle royale at a German airport in Civil War (he was kind of hard to miss, seeing as his Ant-Man suit allowed him to grow to 50+ feet tall and he fell on an airplane). He’s looking forward to spending time with his daughter Cassie (Abby Ryder Fortson) outside of the house (although in a cute opening scene, he constructs a cardboard-box playtime wonderland for their amusement), as well as to a new legitimate security business with his chatterbox buddy Luis (Michael Peña) and the rest of his former burglary crew (Tip “T.I.” Harris and David Dastmalchian). 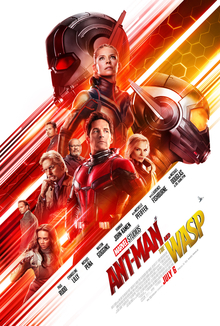 Outside of his mild case of cabin fever and irritation at the FBI agent (Randall Park) constantly striving to catch him violating his house arrest, Scott is also feeling guilty about the consequences of his Avengers sojourn for his one-time mentor and prior Ant-Man Hank Pym (Michael Douglas) and his one-time flame and Pym’s daughter Hope van Dyne (Evangeline Lilly). Hank and Hope are wanted for giving Scott the power suit (which he is supposed to have gotten rid of after his arrest but of course has not) and have gone on the run from the law, but they have also built a high-tech lab in a shrinkable office building in the hopes of solving a decades-old disappearance. Pym’s wife/partner and Hope’s mother Janet van Dyne (Michelle Pfeiffer) vanished years before into the Quantum Realm (which Scott visited briefly in Ant-Man), and her family has built a high-tech tunnel in their lab in the hopes of going subatomic to find her and bring her back, a mission which they realize they will need Scott’s help to complete. Unfortunately, news of the lab and the many potentially lucrative technological goodies within has trickled out to shady arms dealer Sonny Burch (an oleaginous Walton Goggins), to whom the experimenting fugitives have turned for illicitly-obtained parts for their project. Burch and his henchmen thus join the FBI in pursuing Hank, Hope, Scott, and their size-fluctuating lab building around the San Francisco Bay area. Another more personally-motivated pursuant is Ava Starr a.k.a. Ghost (Hannah John-Kamen), the latest in a recent line of more shaded and complex MCU villains. She’s the daughter of a former S.H.I.E.L.D. colleague that Pym had fired and blacklisted for his dangerous experiments, one of which makes Ava an orphan and gives her the painful and soon-to-be-fatal ability to phase in and out of material reality. Trained and gang-pressed into a role as a spy and assassin, Ava now seeks to remedy her curse of a superpower with the help of Bill Foster (Laurence Fishburne), another ex-colleague of Pym’s at S.H.I.E.L.D. and a father-figure protector in her life, in a manner that will threaten Janet’s fate in the Quantum Realm. This is a super-sized plot, but as in Ant-Man returning director Peyton Reed doesn’t allow it to get in the way of his lean, fun blockbuster potboiler. He retains the prior film’s general light tone and clever shrinking-and-growing action-comedy beats, the latter gags involving a salt shaker, a Pez dispenser, and ravenous seagulls, among other items and scenarios this time around. He also revisits Ant-Man’s signature comedic montage sequence (albeit in a fairly shoehorned-in manner), in which Peña‘s Luis narrates past events in a breezy, inimitable motormouth style while the characters involved act them out, right down to mouthing his Latino-bro colloquialisms (he’s a delight in general, one of the MCU’s best humble normal-human sidekicks once again). Lilly revels in her line delivery in this sequence particularly; it’s all part of her expanded and beefed up role as befits the title, her winged Wasp acting as equal (if not superior) partner to Rudd’s Ant-Man. Rudd himself, still low-key one of Marvel Studios’ most offbeat but successful casting decisions, is not one to be outdone in charm and good-natured pluck; he gets a showcase of his un-self-conscious skills of comic mimicry, as well, when Pfeiffer’s Janet possesses his body remotely from the Quantum Realm to point Hank and Hope in her direction. Douglas does well with more withering dismissals (Hank Pym is given ample reason to disdain Scott Lang by the latter’s actions), although he and Pfeiffer are saddled in early flashbacks with uncanny-valley digital de-aged versions of themselves and it does their larger performances no favours to start that way. John-Kamen brings a different, intense, hard-glance energy to the film, meanwhile, but hopefully she and Ava will be back on the other side of the Infinity War Thanos snap-ocalypse. Ah, there’s that sobering reminder of the recent telegraphed heavy turn that the MCU has decided to take again. Honestly, Ant-Man and the Wasp, already stripped of literally any political dimension whatsoever, would be a more uncomplicated and purely enjoyable experience if it ended without the usual mid- and post-credits stingers. Beyond being downers to the light tone and good-natured mood of the film, the decision to drag Ant-Man’s milieu into the Thanos cataclysm undermines the storytelling of Ant-Man and the Wasp as well. Not only did this controversial zero-sum cliffhanger disfigure the affect of Infinity War, it’s now causing problems in the MCU’s more carefree corners as well (one could argue that Thanos snapped away plenty of good thematic and character development in Guardians of the Galaxy, Vol. 2, Thor: Ragnarok, and Black Panther as well, but that’s a discussion for another day). For most of Ant-Man and the Wasp, that problematic game-changer is forgotten. And frankly, it felt kind of nice. But such happy escapes, the MCU is now at pains to remind us, are only fleeting. Art (albeit highly commercial) imitating life, I suppose.